Scott Wolfe, MD, chief emeritus of the Hand and Upper Extremity Service at Hospital for Special Surgery in New York City, has received the prestigious Kappa Delta Orthopaedic Research Award. Considered one of the highest honors that an orthopedic researcher can receive, it is presented to investigators who make key discoveries leading to major advances in the field of orthopedics. 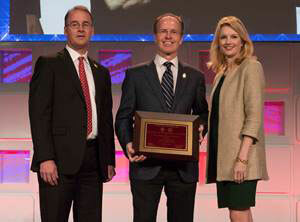 Dr. Wolfe was honored at a ceremony at the American Academy of Orthopaedic Surgeons Annual Meeting on March 16 in San Diego. He will present his award-winning paper at the meeting of the Orthopaedic Research Society on March 19. Collaborating with his research colleague, Joseph (Trey) Crisco, PhD, Dr. Wolfe sought to gain a better understanding of the underlying mechanisms of wrist movement with the goal of developing new and better treatments for arthritis and other wrist injuries. Dr. Crisco, with whom Dr. Wolfe shares the Kappa Delta Award, is director of the Bioengineering Laboratory in the Department of Orthopaedics at Warren Alpert Medical School of Brown University and Rhode Island Hospital. “Receiving the Kappa Delta Award is an incredible honor, representing to us an endorsement of our decades of work together and the importance of this work to patient care,” Dr. Wolfe noted. “We are honored and humbled that the American Academy of Orthopaedic Surgeons chose our work to receive this award, particularly when considering the ‘giants’ of orthopedic surgery who have preceded us and our many colleagues who are currently doing incredible work in so many fields of orthopedic surgery. The wrist is the most complex joint in the human body. Wrist arthritis, affecting up to 4.8 million Americans, is one of the most common and debilitating conditions treated by hand surgeons. Although current surgical interventions can alleviate arthritis pain, wrist motion and the ability to perform certain activities are often limited after surgery. The work of Drs. Wolfe and Crisco can be described in three stages, roughly corresponding to the three decades of their collaborative efforts. In the 1990s, they dedicated their work to unraveling the complexity of how individual bones moved in normal and injured wrists. They designed and validated a three-dimensional motion analysis system to measure wrist kinematics during active tasks. The second decade of their work focused on understanding the wrist motions needed to perform both ordinary activities, such as pouring water from a pitcher, as well as high-demand activities, such as throwing a baseball or hammering a nail into a wall. They studied this in patients with normal wrists; in individuals who had sustained a wrist injury; in patients with wrist arthritis; and in those who had surgery to relieve arthritis pain. Since 2010, Drs. Wolfe and Crisco have turned their attention to developing new and improved treatments for wrist arthritis. “In our third decade of research, we have been using the knowledge we’ve gained to craft solutions that would enable the wrist to move more normally during ordinary and high-demand activities,” Dr. Wolfe noted. He and Dr. Crisco have designed new implants for total and partial wrist replacements that, if proven successful, would allow for better movement, enabling patients to return to higher levels of function with less pain. Drs. Wolfe and Crisco have received approximately $10 million dollars in funding from the National Institutes of Health for their work over the past 27 years.